Sharon Long is with us today to talk about the second book in Linwood Barclay’s Promise Falls Trilogy thriller series. 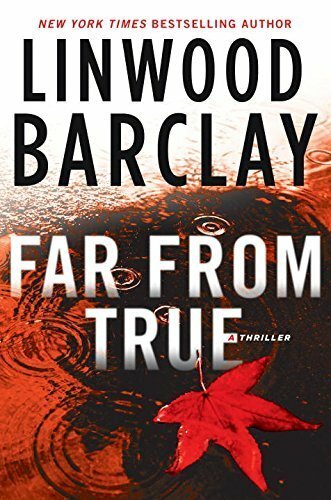 Far from True, published by New American Library, released on March 22. This is the second book in a trilogy and since I loved the first book, I was excited to read this one. I enjoyed this book even more than the first. “After the screen of a run-down drive-in movie theater collapses and kills four people, the daughter of one of the victims asks private investigator Cal Weaver to look into a break-in at her father's house. Cal discovers a hidden room where salacious activities have taken place--as well as evidence of missing DVDs. But it may not be the discs the thief was interested in. . . . This book is full of action including an attempted kidnapping, missing professor’s wife, a vacationing spouse and the violent head of security at the local college. David is back and is working for the disgraced Mayor on his ill-fated campaign to gain back control of the town. As the story progress, both Deputy Duckworth and Cal are beginning to see connections to the previously unsolved murders. In Far from True, the reader revisits more of the previous characters along with being introduced to new citizens in this small NY town. Again, each book is a standalone with its own plot; however, there is an ongoing plot throughout the trilogy. The third book, The Twenty-Three, releases November 2016. I am anxious to see how Linwood ties it all together. You can read our review of the first book, Broken Promise here.